A few weeks ago I posted about 'Boxedora' a documentary on a woman who wants to box but she lives in Cuba where it's stricly men only. A reader (thank you!) sent me a link this week to an interview with Namibia Flores on her last day in Cuba. Yes, she is leaving her home - which by the way is the home of the sweetest male boxing style you'll ever see - to train in America. I know there are many bigger problems in the world but this just doesn't make sense. Men's boxing in Cuba is revered. Their boxers have won more gold medals at the Olympics than any other country. That means of course they have the best coaches and gyms, a depth of talent you simply won't find anywhere else. How good is Flores? She trained and sparred with the national youth (male) team and says: 'I was the same'. Coming from Ireland this breaks my heart for an additional reason. The first female boxer here was Deirdre Gogarty, who left Ireland for America in the early 1990s. She left because women's boxing was banned here, and having fought some 'demonstration' fights without earning any change in the system, she simply left. I met Gogarty at her old boxing gym when she was in Dublin in 2012 promoting her book 'Call to the Ring'. 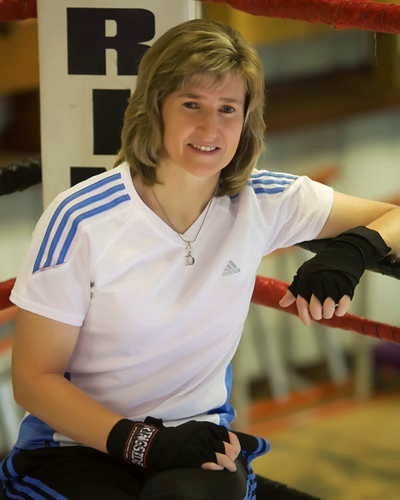 Her most famous fight was against Christy Martin in 1996, clips from that are on her blog here. An inspiration to fighters like Olympian Katie Taylor, it's sad that her battle continues to be fought today.